Based on feedback we received from the participants, this conference was an empowering and learning experience, particularly with reference to raising awareness about the problems in the Israeli-Palestinian conflict. For many, the conference provided an intense and first-hand experience of some of the salient issues, which they could witness with their own eyes – the Separation Wall, limitations on freedom of movement, the overwhelming presence of soldiers in the occupied areas, the fear of violence during democratic demonstrations. The very fact that internationals were housed in a Palestinian part of Jerusalem gave them an opportunity to meet Palestinians first hand, breaking down fears and stereotypes. Information was also provided in an array of formats – academics who analyzed the situation, women who directly experience the problems, hard data from NGOs that engage in documentation. The “welcome kit” also provided each participant with maps showing Israel/Palestine, the Israeli settlements in the occupied territories, and the layout of the Old City and Jerusalem. At the conference site, many NGOs exhibited organizational material and shared information about their work for peace and human rights. This was an opportunity to showcase the work of the nine women’s peace organizations in Israel, as well as others in the peace movement. Exhibits provided space to explain the complexities of the Separation Wall, the Tali Fahima case, the humanitarian and solidarity work. The organizers also hung a political exhibit of “accessories” and photos from Women in Black vigils throughout the world (photo), providing some creative ideas for further action by participants. Women were also exposed to information about conflict situations outside the Middle East, though to a much less extent. They heard reports from women from Chechnya, the Democratic Republic of the Congo, Guatemala, El Salvador, and other locations. Networks, both formal and informal, were created or strengthened for further joint work. There was a substantial increase in subscribers to the Women in Black e-mail networks in 4 languages (Spanish, French, Italian, English), and these networks established translation exchanges so they can share information among them. Many participants have already begun to share their experiences in articles in local newspapers, weblogs and websites. Many have reported that they are making presentations in their home communities. We do not have a tally of Internet mentions, but as of mid-September, a search on "women in black" + conference + Jerusalem brings up 28,000 links. See “Media Coverage” for more details. Webcast: All the plenary sessions and open mike sessions were webcast live, meaning that anyone with access to Internet could watch and listen to the events as they were happening. This was important because it increased the number of people who would be exposed to our message, and gave at least indirect access to women who were unable to attend (including Palestinian women prevented from entering Jerusalem). Website statistics indicate that approximately 2,000 people watched the conference live as it was happening, which is remarkable considering the time zone differences across the globe. But this number does not reflect the thousands more who will watch videos of the proceedings in the coming months, as they are available for a full year on the website http://web11.mediazone.co.il/media/wib/130805/. Conference website: An international volunteer created a new site for the conference. This site invited women to not just “watch”, but actually “participate” from a distance by writing their comments, questions, and observations to the site, some of which were read to the conference from the stage. The web mistress also reported events directly onto the site. Israel’s rescheduled evacuation from Gaza fell exactly on the days planned for the conference. We knew this would adversely affect our success at media coverage, but it was too late to change the conference date. Although the media were obsessed by the dramatic events in Gaza and reluctant to run stories about the conference, we did record some significant media achievements thanks to persistent efforts. Channel 1, Israel’s state-owned TV station, did a feature on the conference during prime time on Saturday night, showing clips of Friday’s vigil and a studio interview with one of the participants from Serbia-Montenegro. Yediot Aharonot, Israel’s largest daily, ran a long magazine feature in their weekend edition about the participant from Guatemala. The Jerusalem Post, a widely read English language daily in Israel, ran a large spread on the conference itself. Russian-language media conducted interviews on TV and radio, also covering the Kalandia demonstration. Coverage in Arabic was extensive. Newspapers: WAFA, the Palestinian news agency, covered the entire conference and political actions. This report appeared in the following daily newspapers in the West Bank: Al Quds, Al Ayam, Alhayat, and Aljadeda. Other reports appeared within the Arabic-language press in Israel: A-Sinara, Kul al-Arab, and al-Ittihad. Radio: Conference activities were reported in the news and features programming of Radio Alshams (in Israel) as well as stations in the Territories : Radio Falastin, Radio Ajyal, and Radio Amwaj. TV: Palestinian TV reported on Friday’s vigil. Radio Feminista in Costa Rica sent two delegates to the conference who covered it live in Spanish, holding interviews and describing the scene. Radio interviews of participants were conducted for stations in Spain, New York, and Seattle. We assume that articles appeared in other media, but we do not monitor the media outside the region. Numerous Internet sites continue to carry photos and articles about the conference, many written by conference participants themselves. · Empower the international movement: This event succeeded in giving solidarity and support to groups that are scattered internationally. In addition to the personal contacts established, we were able to expand and integrate four language-based networks of international communication. As a result, we now have a stronger international movement that will empower local groups and enhance the impact of the movement as a whole. 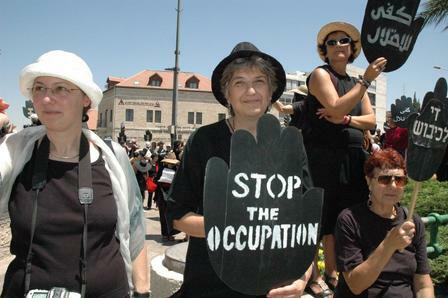 · Increase visibility for our message: While excellent international media coverage did increase the visibility of Women in Black and women’s peace organizing globally, the impact within Israel was minimal. One reason for this is the overlap with the Gaza evacuation, which dominated the Israeli media during this period. A second reason is that we did not engage in sufficient recruiting of Israeli participants, as we became so overwhelmed with the huge response from overseas and the logistical challenges that were posed. · Empower women as peacemakers. Women at the conference frequently highlighted the importance of (and distributed) UN Security Council Resolution 1325. As such, the event was useful for raising awareness among women and urging them to view themselves as potential actors in critical decision making. · Raise awareness about women in conflict zones: Thanks to the presence of women from conflict zones outside the Middle East, participants became better informed of the global phenomena – that women in war zones pay a high, gender-specific price – and are thereby able to address it. · Deepen understanding of global issues: The subject of the global links of business, the military, and gender was discussed by many women in panels and workshops, and helped expose women to this nexus of influence. · Empower the Israeli and Palestinian women’s movements: Post-conference, some women from regions of conflict toured areas of Israel and Palestine, speaking about their own situations and extending solidarity to the local women’s movements in more peripheral areas. Audiences were moved and hopeful to learn of the existence of women’s peace movements in other countries, and to hear of their solidarity with local peace efforts. In summary, the conference met all our strategic expectations for impact on the global women’s peace movement, but fell short of our expectations on the local level. Globally, however, the conference was a great success. It provided information, tools, and inspiration to its participants, helping transform them into highly motivated messengers of the theme of this conference: “Women resist occupation and war”.